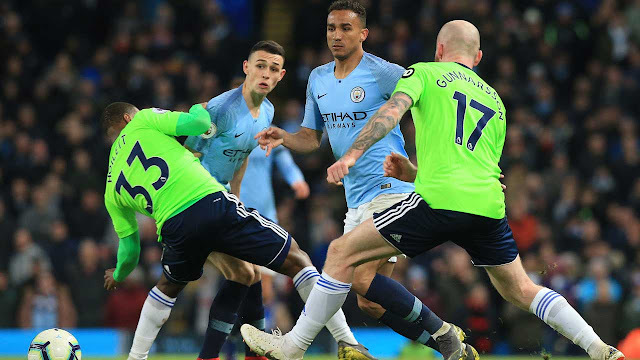 MANCHESTER, United Kingdom (AFP) - Pep Guardiola's Manchester City eased to a 2-0 win over Cardiff at the Etihad Stadium on Wednesday (April 3) to retake top spot in the Premier League from title rivals Liverpool. Goals from Kevin De Bruyne and Leroy Sane were enough to lift City back into top spot, at least until Friday, when Jurgen Klopp's team visit Southampton. City now have a maximum of 13 games remaining in a potentially historic season that could see them add the Premier League, FA Cup and Champions League to the League Cup they lifted against Chelsea in February. But, whatever the remaining two months holds for Guardiola's team, they are back in the driving seat in the Premier League on 80 points, one ahead of Liverpool. Both sides have six league games remaining. Guardiola, whose side play Brighton in the FA Cup semi-finals on Saturday, was able to make seven changes against Neil Warnock's struggling side, resting key players in the process. The alterations did not dull City's attacking intent but Gabriel Jesus, chosen with Sergio Aguero having been left out as a precaution, was guilty of a string of first-half misses. De Bruyne claimed the first goal, after just five minutes, from Aymeric Laporte's through ball, with a strong run and blistering shot from a tight angle that left questions over Neil Etheridge, beaten at his near post.